[i am a dekaphobic]: Escan Manila: Homemade Chorizo at your Doorstep! I love it best when served with a runny egg and fried rice. I am in love with Escan Manila's Hamonado, as it is quite garlicky and the fat that comes with it enhances the flavor of the chorizo. The Rekado reminds me of Vigan longganisa and can go well with some vinegar. Though with small bits of fat, the finished product isn't greasy at all. I am so impressed with Escan Manila that I could eat it the whole day. 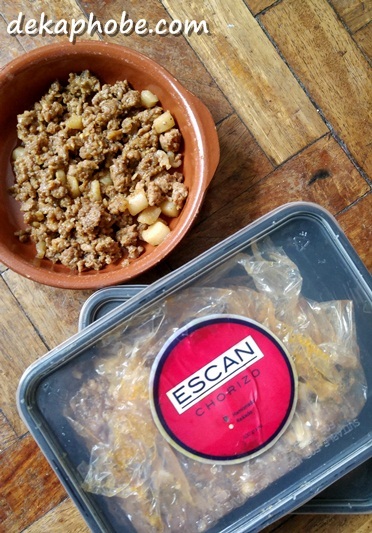 A pack of Escan Manila Chorizo is good for 3-4 servings and can last for weeks if frozen. Order from Escan Manila and pay only Php 35 for delivery fees. I highly recommend that you try this. It is seriously a game changer breakfast for me.